Synovia is the Number One recommended brand by orthopedic surgeons and rheumatologists to protect cartilage, and to help keep joints healthy and flexible. High-potency, Breakthrough formulation, SYNOVIA is a therapeutic combination of SEVEN joint health ingredients. SYNOVIA contains natural anti-inflammatory ingredients that help repair joint tissues by stimulating the manufacture of cartilage. SYNOVIA helps protect cartilage from damage and accelerates healing. SYNOVIA help lubricate and cushion the joint, building new synovial fluid and providing osteoarthritis knee pain relief. The healing and anti-inflammatory effects of SYNOVIA result in less pain and improved quality of life for people suffering from arthritis. Up to four weeks are needed for SYNOVIA to begin taking effect and the longer it is used, the more pronounced the benefits. In healthy joints, ligaments and cartilage absorb impact and allow for smooth, pain-free motion. Osteoarthritis (OA) is a common condition where these soft joint tissues become inflamed, harden, or wear away, resulting in loss of mobility and pain. This debilitating disease can affect us at any time though it becomes more common as we age. Many of the pain-killers and anti-inflammatory drugs used to suppress arthritis symptoms can cause serious side effects. People wishing to reduce or avoid these potentially dangerous drugs are increasingly turning to safe, proven, natural alternatives that not only lessen symptoms but promote long-term healing. 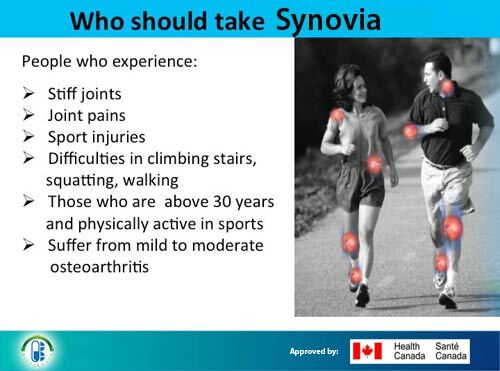 SYNOVIA Helps to relieve the pain of osteoarthritis. It is highly effective in reducing bone and joint pain, it helps in the formation of connective tissues and it protects against the deterioration of cartilage from this chronic joint disease. RA is a chronic disease that causes pain, stiffness, swelling and limited motion and function of many joints. While RA can affect any joint, the small joints in the hands and feet tend to be involved most often. The stiffness seen in active RA is most often worst in the morning. It may last one to two hours. Stiffness for a long time in the morning is a clue that you may have RA. Affects over hundred million people worldwide. Of these, about 75% are women. 1–3% of women may get rheumatoid arthritis in their lifetime. The disease most often begins between the fourth and sixth decades of life. However, RA can start at any age. In fact, two-thirds of people with Arthritis are under the age of 65 (www.Arthritis.org). It is important to be physically active most of the time but to sometimes scale back activities when the disease flares. In general, rest is helpful when a joint is inflamed, or when you feel tired. At these times, do gentle range-of-motion exercises, such as stretching. This will keep the joint flexible. When you feel better, do low-impact aerobic exercises, such as walking, and exercises to boost muscle strength. This will improve your overall health and reduce pressure on your joints. Many of the pain-killers and anti-inflammatory drugs used to suppress arthritis symptoms can cause serious side effects. People wishing to reduce or avoid these potentially dangerous drugs are increasingly turning to safe, proven, natural alternatives that not only lessen symptoms but promote long-term healing. Boswellia serrata: Boswellic acids – the active components – have strong anti-inflammatory and analgesic properties. They also may help prevent cartilage loss and inhibit the autoimmune process, making Boswellia a potential therapy for RA, too. 2. Capsicum Annuum: capsaicin reduces substance P, a pain transmitter. 3. Curcuma longa: Curcumin blocks inflammatory cytokines and enzymes, including cyclooxygenase-2 (COX-2), the target of celecoxib. 4. Zingiber officinale: ginger has been shown to have anti-inflammatory properties similar to ibuprofen and COX-2 inhibitors. Ginger also suppresses leukotrienes (inflammatory molecules) and switches off certain inflammatory genes, making it potentially more effective than conventional pain relievers. 5. Glucosamine sulfate: Glucosamine produced in the body provides natural building blocks for growth, repair, and maintenance of cartilage. Like chondroitin, glucosamine may lubricate joints, help cartilage retain water and prevent its breakdown. Similar to NSAIDs for its effectiveness of easing osteoarthritis symptoms. 6. Methylsulfonylmethane: MSM is an organic sulfur compound. Sulfur is needed to form connective tissue. MSM also seems to act as an analgesic by lessening nerve impulses that transmit pain. 7. Willow Bark: Willow bark contains a chemical called salicin that is similar to aspirin. It eases pain and reduces inflammation. New study suggest that the combination of SYNOVIA and chondroitin sulfate is synergistic and most effective in patients with moderate-to-severe knee pain. Preliminary data . Patients with mild-to-moderate knee pain, SYNOVIA alone can fully control the arthritis pain. In advanced arthritis, we advise arthritis patients to take with SYNOVIA also chondroitin sulfate for complete protection and maximum pain relief effect. Yes! A large number of clinical trials on patients were conducted. The studies reported by top Rheumatologists showed efficacy of the ingredients of SYNOVIA as good as chemical drugs such as Methotrexate and non-steroidal anti-inflammatory drugs. However, SYNOVIA ingredients enjoy no adverse effects that chemical drugs have. 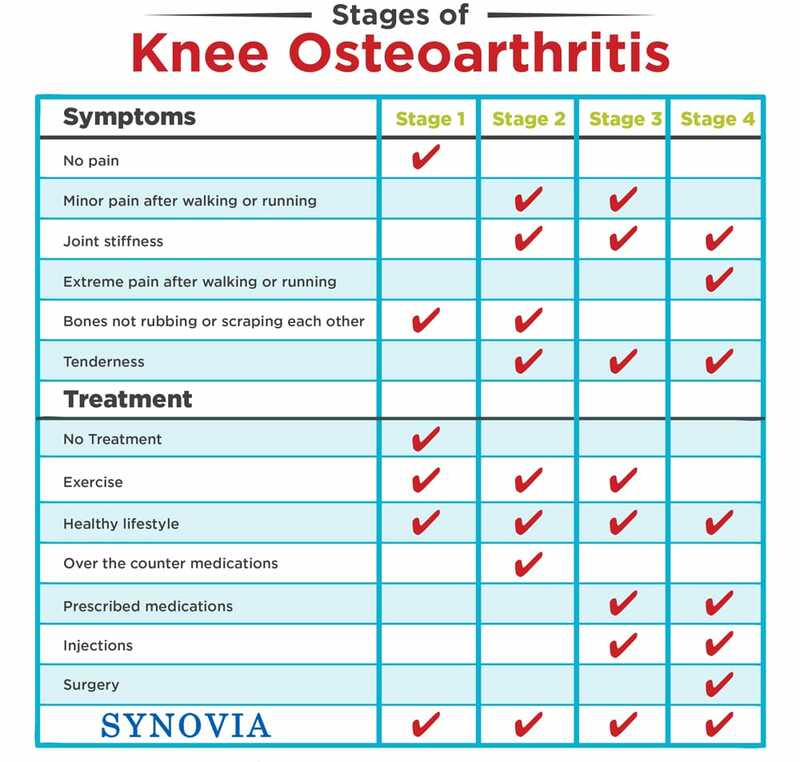 What stage of Knee Osteoarthritis am I experiencing and how would I know SYNOVIA is right for me? Osteoarthritis is classified into four stages of symptoms that you could possibly be experiencing. Stage 1 being the least severe and stage 4 the most serious and severe of them all. SYNOVIA has been shown to be effective in reducing pain and inflammation in all four stages of osteoarthritis. See table below to know which stage your osteoarthritis. No. 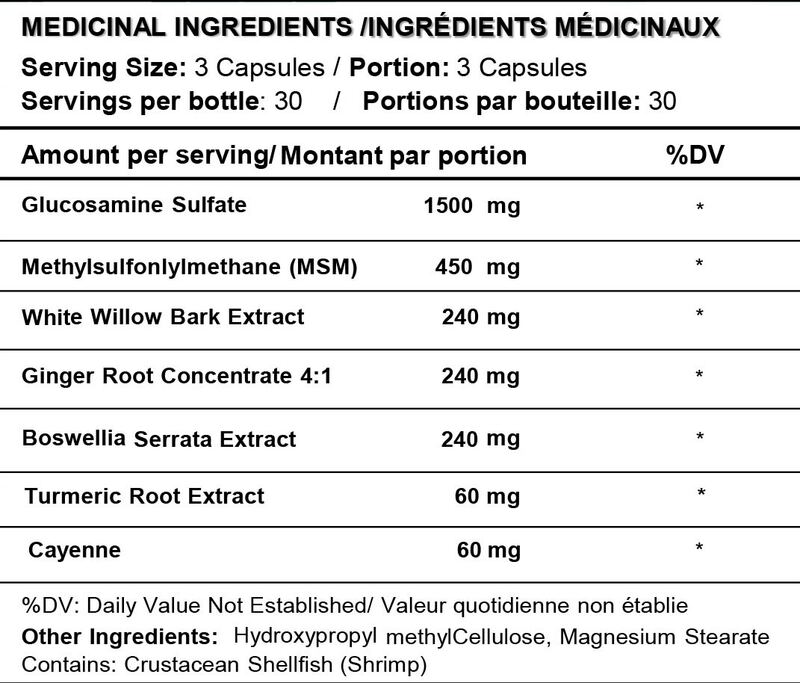 SYNOVIA is herbal supplement and contains only the finest natural botanicals clinically proven to reduce inflammation, you do not need a prescription. Will I need to use SYNOVIA forever? A course of 3-6 months can significantly reduce inflammation and pain. It is important to take the correct dose everyday till you finish the course to get the best results. Most patients who benefit from SYNOVIA will continue taking it to avoid any chance of relapse of pain and inflammation. The usual dose is 3 capsules daily. Each bottle contains 90 capsules and is a 1 month supply. You can take them at the same time or three times a day, as you wish. It is preferable, however, to take the capsules at meal times or with plenty of water.You should take the capsules everyday, and be very disciplined especially within the first month and try not to miss a dose. If you miss a dose, take it as soon as remembered; do not take if it is almost time for the next dose, instead, skip the missed dose and resume your usual dosing schedule. Do not "double-up" the dose to catch up. Do you have difficulty swallowing capsules? You can open the capsules by pulling the two halves apart. The contents may be mixed with water, fruit juice or yogurt. SYNOVIA dissolves readily. Will I experience any side effects? What if I have a medical condition? No, there are no side effects when taking SYNOVIA. It is completely safe, but we recommend before beginning a course of any type of daily supplement, that you check with your doctor if you have any serious medical conditions or are currently on other medication.